James Thompson Clayborn was born on 19 May 1822 in Knoxville, Tennessee, to Ephraim and Mary Claybourn. [Verner M. Claybourn and Harriette Pinnell Threlkeld, The Claybourn Family (A-1 Business Service, 1959). Subsequent census data would seem to confirm this date.] When James was still a young child of about three years old (c. 1825), his family moved to DeKalb County, Tennessee, and lived two or three miles from the log cabin village of Liberty, Tennessee. At the age of twenty-one, on 21 December 1843, James married Melinda K. Scott, who was born on 17 August 1827.[Ibid.] Roughly twenty years later James’s parents left Liberty for Kentucky, but James stayed in the area and settled in on the farm his parents had owned. It is worth noting that James and Melinda each indicated in both the 1850 and 1860 census that neither of them could read or write, and in the 1870 census James indicated he could read but not write. This may help explain a number of variations in the spelling of this branch’s name. In most of the census records the family’s name is spelled “Clayborn”, and that is also how most of James and Melinda’s descendants spelled the surname. Yet on their obelisk headstone James and Melinda used the spelling of “Claybourn”, and Melinda’s name is spelled “Belinda”. Nevertheless, because “Melinda” and “Clayborn” appear to be the most commonly used and accepted spelling during and after their lifetime, that is the primary spelling used in this biographical sketch. The American Civil War affected virtually every family in the country, and James was not immune. Although the state became a part of the Confederacy, East Tennessee was strongly pro-Union before secession, and strongly pro-Union Tennesseans remained there and existed in pockets throughout the state during the war. James and Melinda appear to have been part of this pro-Union group. 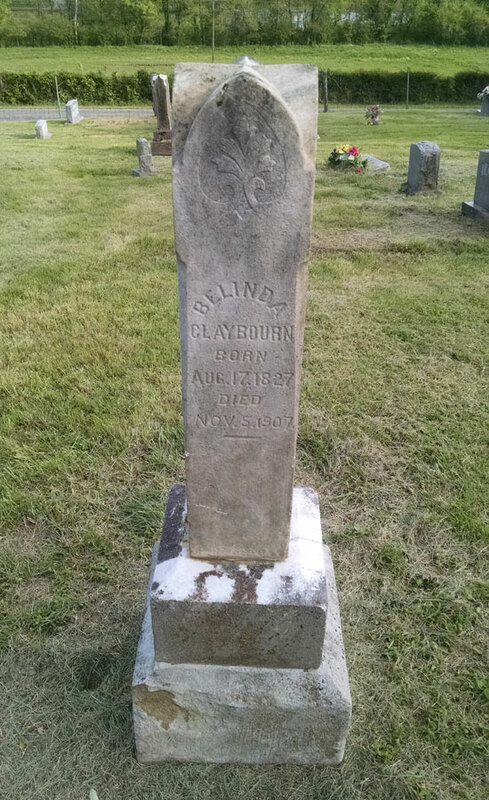 Both of James’s brothers, John B. Claiborne of Arkansas and William Divine Claybourn of Illinois, also stayed loyal to the Union, with William and his sons fighting and shedding blood for the cause. In 1936 researcher Harriette Threlked visited Nancy Johnson, the youngest child of James. Nancy showed Harriette a certificate signed by J. A. Jusan, M.D., certifying that he had examined James and found him unable to perform militia duty because of “hemroids” (sic), signed 16 December 1861. [Claybourn, The Claybourn Family.] William Divine Claybourn once told Harriette that James was “loyal to the Union,” so one could speculate that James might have concocted medical problems to avoid fighting for the Confederacy. Either way, James did not fight in the conflict. 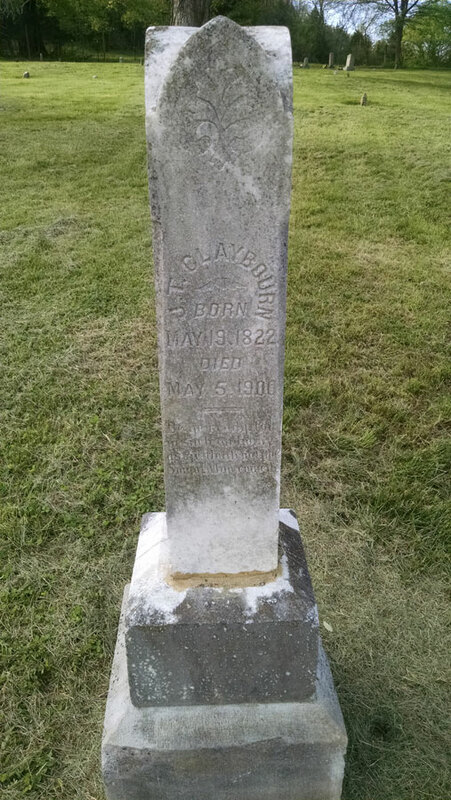 Perhaps the most poignant evidence of James’s sympathies is that in 1863, at the height of the War, he chose to name his newborn son Abraham Lincoln Clayborn after the famous president leading the Union. Taken together, the evidence strongly suggests that James supported the Union in the conflict and purposefully avoided fighting for the Confederacy. Life was not entirely idyllic, however, because from 1879 to 1885 James T. and his eldest son, John Branchford, were involved in a legal dispute before the DeKalb County Chancery Court. [DeKalb County Chancery Court Rule Docket Page 160, Entry # 1322, available at http://listsearches.rootsweb.com/th/read/WILDER-SOUTH/2004-07/1090620060.] The two were sued by several members of the Wilder family because James and John had apparently fallen behind on payments under a note for land. The Court ruled that title in the land was to vest in the heirs of the Wilder family. However the Wilder heirs could not divide the land among themselves satisfactorily, so it was sold to J. W. Scott and his son E.Y. Scott. We examined James T. Clayborn’s family Bible and copied the birth dates of his family from it. We saw his large framed photograph, and he bore a striking resemblance to the photo of his brother William Divine Claybourn. “Aunt Nan,” as she was called, answered instantly that her grandfather was Ephraim Claybourn, but when asked her great grandfather’s name, she couldn’t recall it. When asked if it were Joshua, she brightened up, as if remembering, and said, “Yes, that’s it.” She had learned of a William Hawker, near Liberty, when asked if any Hawkers lived there then. The other letter was really an undated fragment and so worn along the edges that many words could not be made out, but it was written by Polly Claybourn to her son James. She was visiting somewhere and wanted to know when James could come for her. 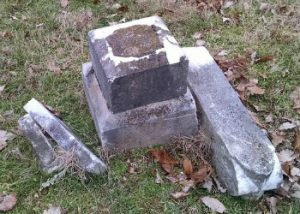 In 2015 the Claybourn Genealogical Society undertook a project to repair and restore the headstone obelisk for James and Melinda/Belinda. As pictured below, it had fallen apart in a terribly disrespectful state. Thanks to the donations of members and supporters, the obelisk was restored to its original state. The restoration involved a new footer of level concrete slab, a level base on the footer, and concrete adhesive to secure the base, pedestal, and obelisk. Mary Elizabeth Clayborn (click name for separate biographical sketch) was born on 12 October 1944 and died on 3 February 1921. Martha M. Clayborn was born on 18 April 1846 and died on 1 August 1865. Sarah Frances Clayborn was born on 7 September 1847 in DeKalb County, Tennessee. She married (1st) to William Overton Neal on 3 July 1867 in DeKalb County. [William Neal was born in about 1825.] Together they had several children, listed below, and possibly more that died at a young age. William died on 8 April 1885 and about a year and a half later on 3 October 1886 Sarah married (2nd) to Daniel Driver, who was about seventeen years her junior. [Daniel Driver was born on 1 January 1864 to John Erwin Driver (1820-1865) and Louisa Braswell (1818-1893).] Daniel died on 25 July 1905 and sometime thereafter Sarah married William Harrison Hayes. [William Hayes was born on 26 November 1840 and died on 24 April 1931. He had previously been married to a Molly M. Parker and was a veteran of the U.S. Civil War.] Sarah died on 4 April 1923 and is buried in Dismal Cemetery in DeKalb County. Harriet Emeline Neal was born on 12 June 1868 in DeKalb County, Tennessee. She married on 13 May 1883 to Thomas Jefferson Hale and together they had numerous children. Harriet died on 6 August 1937 and Thomas died on 22 March 1946, both in DeKalb County. James T. Neal was born on 11 February 1870. He married on 21 February 1886 to Nancy Crook. Together they had at least six children together. James died on 17 July 1950. Frances Neal was born on 7 October 1872 in DeKalb County. She married on 20 June 1886 to Columbus Driver (born in 1864). Frances died on 2 August 1906 and Columbus died in 1943. They are both buried in Smith County, Tennessee, in the Columbus Driver Cemetery. Ephraim Ferrell Neal was born on 8 January 1875 in DeKalb County and lived for a time in Alexandria, Tennessee. He died on 24 November 1941. John Branchford Clayborn (click name for separate biographical sketch) was born on 3 November 1849 and died on 23 May 1932. He married twice and had ten children. Ephraim Cleibron (click name for separate biographical sketch) was born on 29 January 1852 in DeKalb County, Tennessee, and died in about 1905 in Smith County, Tennessee. While his father and siblings used various spellings of the surname, Ephraim’s is particularly unique and most unlike any other in the family. Phoebe Ann Clayborn (click name for separate biographical sketch) was born on 24 January 1854. Luticia A. Clayborn (“Tisha”) was born on 31 August 1855 in DeKalb County, Tennessee. She married first to John Crook (c. 1821 – c. 1889) as his fourth wife on 23 April 1888; they had no children. John Crook and his second wife Charlotte Carr (c. 1827 – c. 1864) are the parents of Sylvanus Shamus Crook (1850-1920), who married Luticia’s sister Phoebe Ann Clayborn. Tisha married second to his brother William R. Crook (1839-1917) as his second wife on 23 June 1889 in DeKalb County. Tisha died on 22 February 1929 in Nashville, Tennessee. George Houston Crook was born in about 1892 in DeKalb County, Tennessee. He married first to Alva Gene Henley (1894-1957) on 28 September 1913 in DeKalb County. They had four children, listed below, and divorced in about 1929. George married second to a woman named Edna in about 1930 and they had one child. George died on 8 June 1966 in Davidson County, Tennessee. An infant daughter Crook was born and died on 12 June 1914 in DeKalb County, Tennessee. Irene Crook was born on 1 July 1917 in DeKalb County, Tennessee. She married Carl Lewis Mabry (1910-1965) on 17 November 1934 in Williamson County, Tennessee. They had at least two sons. Irene died on 12 December 1992 in Nashville, Tennessee. Austin Crook (female) was born in about 1921 in DeKalb County, Tennessee. An infant son Crook was born and died on 28 September 1923 in DeKalb County, Tennessee. Reba Crook was born in about 1930 in Davidson County, Tennessee. William Howard Clayborn (click name for separate biographical sketch) was born on 31 March 1857 and had five children, all in DeKalb County, Tennessee. James F. Clayborn was born on 20 September 1859 and died on 12 July 1861. Thomas Bethel Claybourn (click name for separate biographical sketch) was born on 3 September 1861. His immediate family and children used various spellings of the surname, but Thomas himself used the spelling “Claybourn.” Thomas died on 26 August 1936. 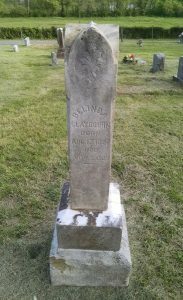 Malinda Clayborn (click name for separate biographical sketch) was born on 20 September 1862 and died in about 1905. Abraham Lincoln Clayborn was born in about 1863 in DeKalb County, Tennessee. His given name is further evidence of the family’s Union sympathies during the American Civil War. He married M. E. Parker on 28 October 1880 in DeKalb County. Manson Clayborn was born on 31 August 1864 and died soon after on 27 July 1865. Nancy Jane Clayborn (click name for separate biological sketch) was born on 31 July 1867 and died on 7 November 1944.